Elko is always ready to go in the truck, no matter where it is going, but this week we’ve taken him to some unique landscapes. 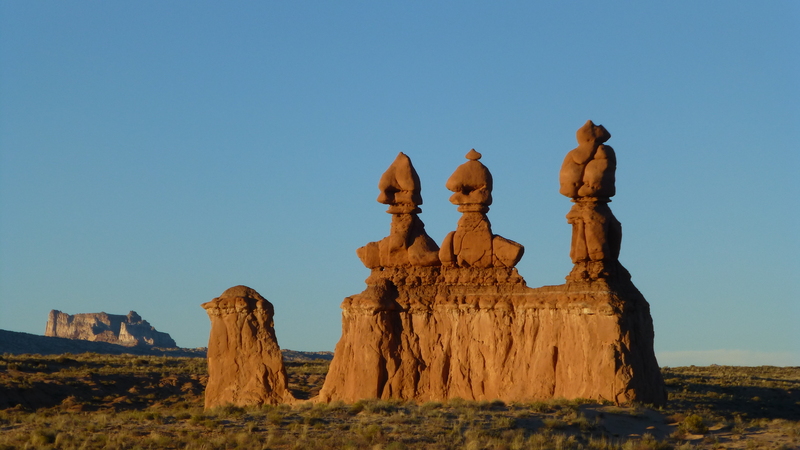 It began at Goblin Valley, a very remote state park in eastern Utah. We stayed only two nights as this was the first time, in 13 years of travel in our trailers, that we have gone without electric and water hook-ups. It was survivable, and we ended up being far more conservative with our battery power than we needed to be. The first night it was so dark in the trailer (without our electric/battery lights) that the useless TV remote control pad was our night light. Of course the good side of it being so dark was that outside the stars were amazing. The milky way was easy to see. 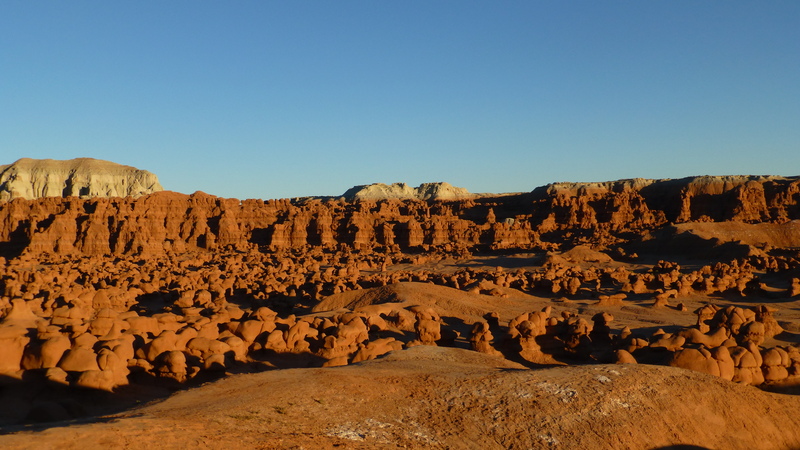 Although I don’t see us camping without hook-ups extensively, to go to unique places like Goblin Valley for a few days, it was worth it. 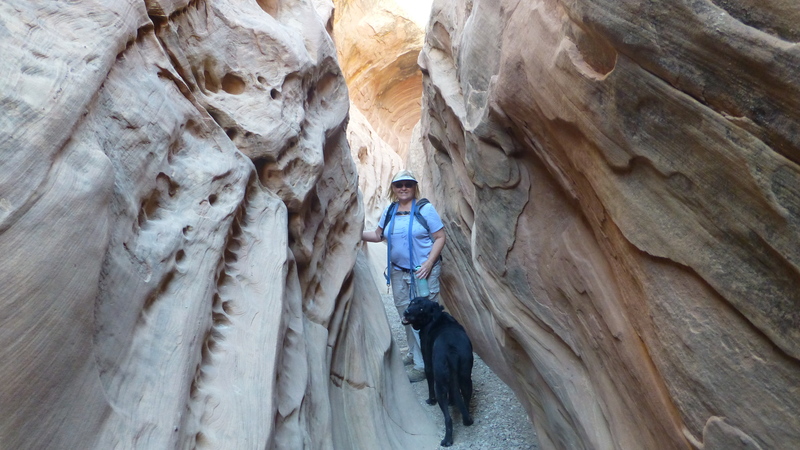 On another day we went to hike the slot canyon at Little Wild Horse Canyon. Randy and I thought it was great but Elko wasn’t a fan. 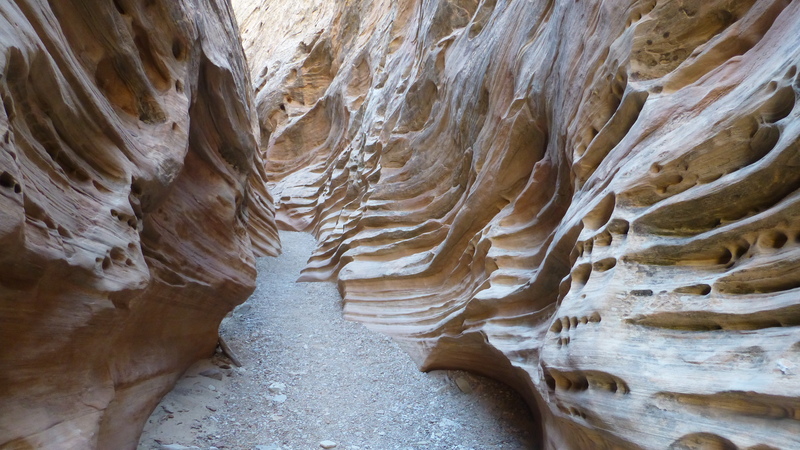 Parts of the canyon were very narrow, as in walk sideways narrow! After a mile or so we had to start scrambling over rocks and that was where it got really hard for Elko. He really likes it when we all three stay together but when we decided that I would take Elko back and Randy would go on, our boy didn’t hesitate at all. 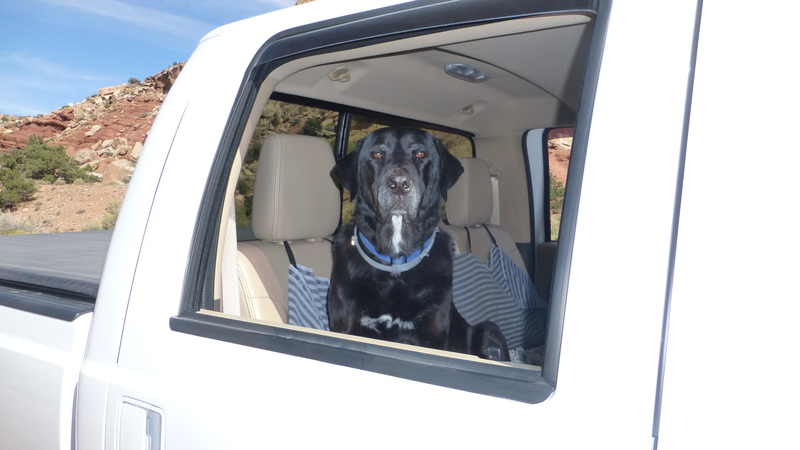 Elko was very glad to leave the slot canyon behind! 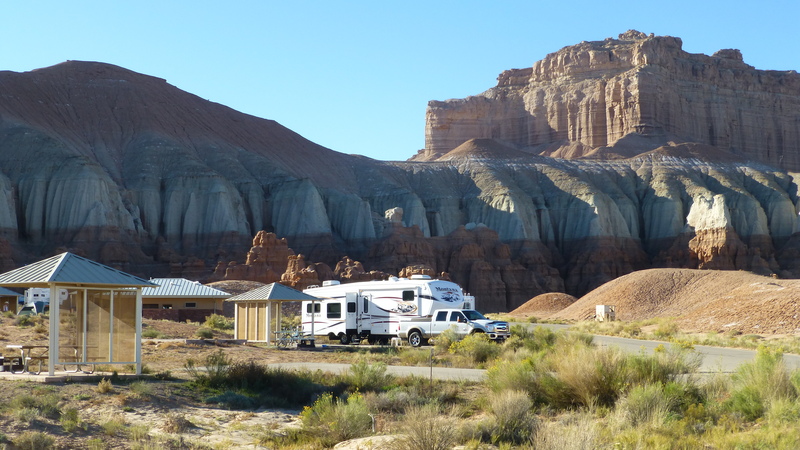 After our two nights of roughing it, we left Goblin Valley and continued on to full hook ups at a private RV park in Torrey, Utah near Capital Reef National Park. We have driven through here numerous times on the way to Lake Powell, and Moab but hadn’t spent much time here. We had seen the petroglyphs and natural bridge on previous trips so this time we enjoyed some scenic drives, old cabins and an old homestead museum/bakery called the Gifford House. 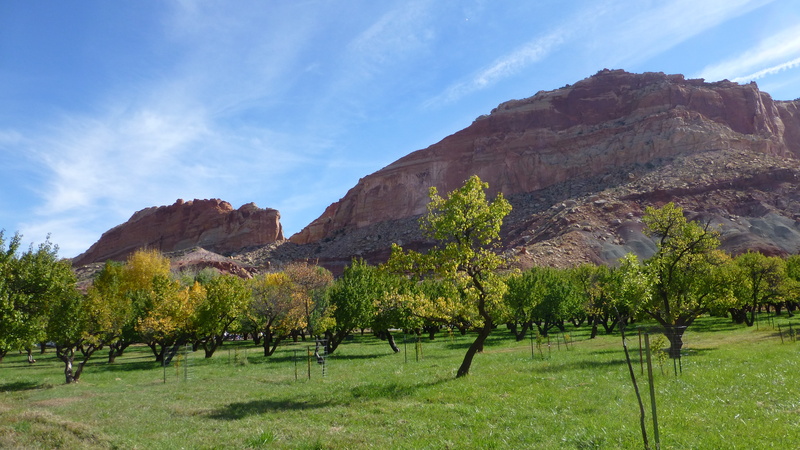 In this area, geologically called the Waterpocket fold, nineteenth century settlers created a community called Fruita. The pioneers used to barter and sell the fruit to the communities nearby and their orchards remain. 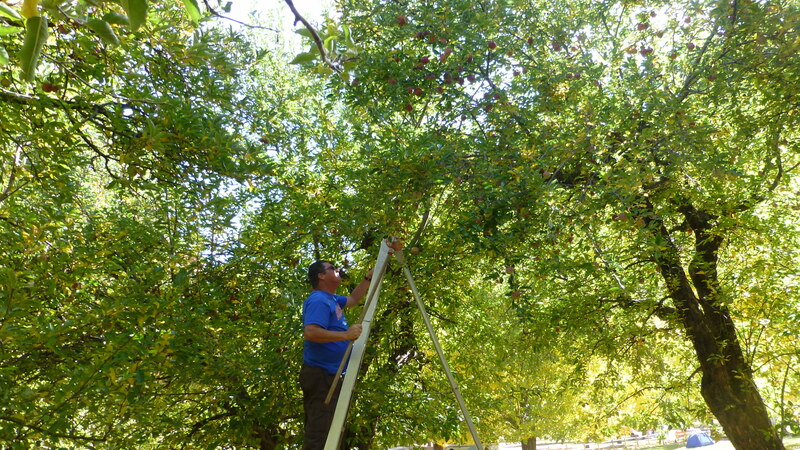 We were able to pick apples, the only fruit available this late in the season, from an old orchard, cared for and managed by the National Park Service. 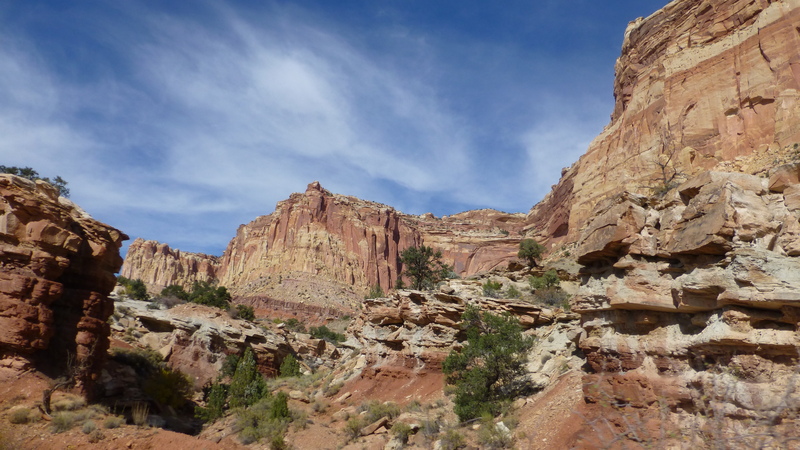 If you haven’t experienced southern Utah, it is truly spectacular. We have one more stop in the area, Kodachrome Basin State Park. We’ve been there before, but it is worth revisiting, another unique landscape! Great pictures! I’m with Elko, I would have headed back to the trailer, too! I didn’t know how I’d like the slot canyon, but I did. It’d be very narrow for a time, then open up to be 10-12 feet, then narrow again. At least I knew there was no way Elko and I could get lost going back out! Randy is functional at best. Hope he’s better by Thursday when we move again! I don’t really want to drive through Bryce Canyon! Have a good trip yourself!